Fun for the Whole Family!! 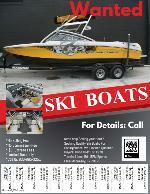 2 Boat Product or Service Ads! WE DO NOT LIMIT OUR FINANCING TO BOATS PURCHASED ONLY FROM US.